In this article I’ll tell you how to take pictures of boxes that are larger than scanners, if you send in your pictures to me, I’ll make nice 3D boxes for a virtual museum out of them. Required is a camera of course, and a table. Set the camera to highest resolution and fine pixels. Recommended is to have a nice white light source (not a flash) and a tri-/monopod. In case it isn’t obvious, the drawings below explained. The brown is a table. 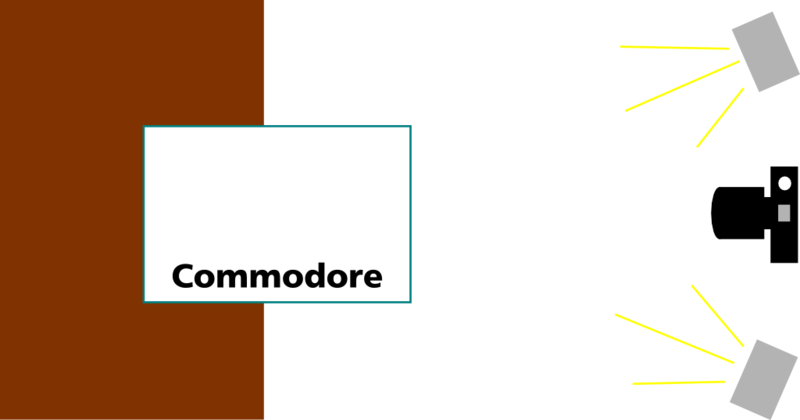 The white with the Commodore logo with a aqua/cyan border represents the box. The black is the camera. The gray with yellow beams are light sources. The red spots are the camera helping dots, they may differ or not be there at all depending on camera. 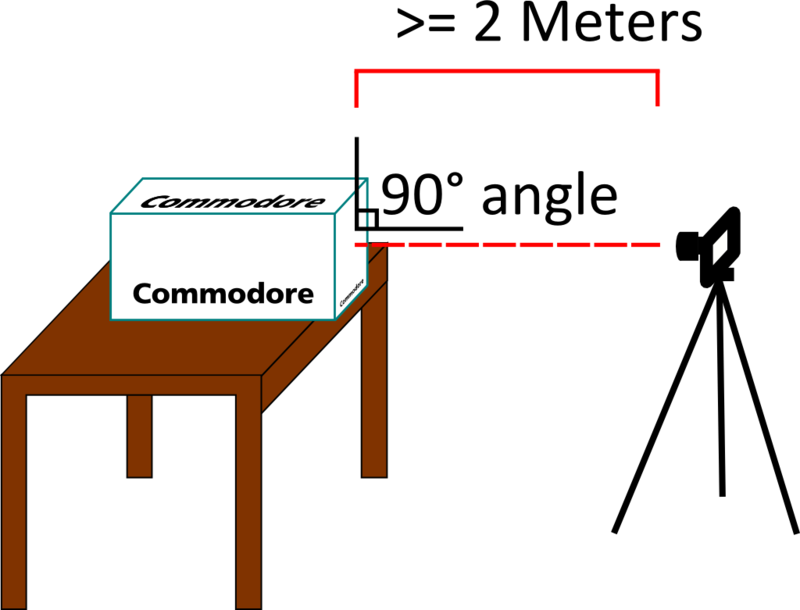 The light source should be from behind in a angle where you don’t see reflection on the box. It can also be from above. Flourescent light is a good source. 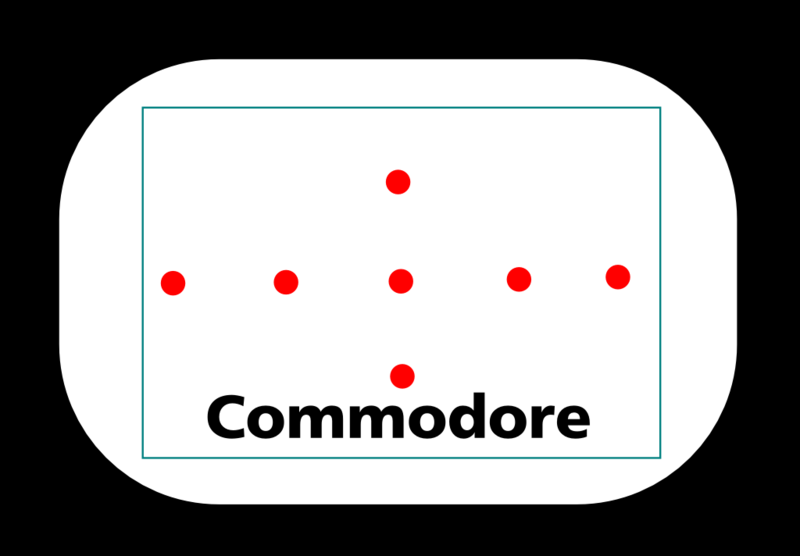 Place the box on the table, letting it stick out from the table edge, as shown on the drawing. The camera must be in a 90 degree angle centered on the side. Some lenses warp the edges if you come too close to the edges, so if you have i.e. a DSLR midrange or lower, you might want to take a few steps back. I have a Canon 700D and using the standard lens I need to be further than 1 meter, 2 meters are good for me. For other camera’s like pocket models, I think you can be closer to the box taking the picture. Make sure you fill out the viewport of the camera, though still having a small margin. 90 degree angle and centered on the box. Make sure you take pictures of all 6 sides, even if the box only has printing on fewer sides, all 6 sides are required for making a 3D box.